‘Tis the season to do dishes … and if you’re doing a lot of dishes, you need a lot of dish towels. 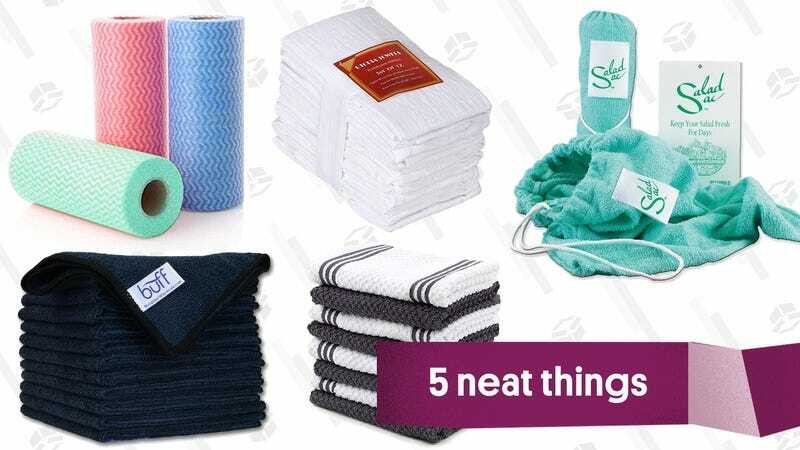 As someone who does a lot of dishes, and who also gets paid to think about dish towels (weird job, but someone’s gotta do it), I have THOUGHTS to share on all kinds of kitchen towels. 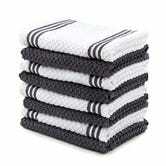 A tiny rant, if you’ll allow me to indulge: There are FAR TOO MANY dish towels that don’t actually dry anything. It’s bananas to me! How can you make a dish towel that doesn’t dry things?!? That’s, like, the main job of a dish towel, drying things! ANYway. After ending up with too many dish towels that didn’t dry things [shakes fist at clouds], I stumbled into a set of flour sack dish towels and I’ve never looked back. Not only do they actually dry dishes, they’re fast-drying — both when in use and in laundering situations — and not overly bulky, making it easy to store a big stack of them. 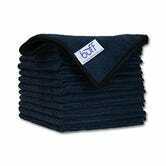 They also make for great cleaning rags when they get to the point of looking a bit too ratty for kitchen use. As great as flour sack dish towels are, they fail at one important kitchen task: They’re not so great for laying out on a kitchen counter to place wet dishes on to dry. I was reminded of this during Thanksgiving week, when I was responsible for cooking the holiday meal — and for doing all the dishes that come along with that task. When it comes to sturdy items like pots and pans, it’s no biggie, but if you’re hand washing delicate glassware, it’s important to give them a lot of cushion to prevent chips and cracks, and these thicker terry cloth dish rags will do just that. Microfiber is the textile you want for cleaning projects, big or small. There’s something unique to microfiber that makes it better at grabbing onto buildup like fingerprints (especially on stainless steel and glass cooktops), soap scum and that sticky, greasy film that tends to collect on cabinet fronts and vent hoods. Microfiber is so good, in fact, that when used for regular cleaning, you can likely forego heavy duty cleaning products and use plain water, or a small amount of diluted dish soap. 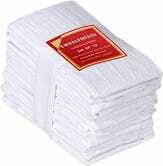 Somewhere in between paper towels and cleaning rags lie these semi-reusable cleaning wipes. They’re not pre-moistened with cleaning solution the way that Clorox or Lysol wipes are, so you’ll need to bring your own all-purpose cleaner to the job, but that’s actually ideal, since it lets you pick the right detergent for the job. They’re also thin, which is what you want when you need to clean tight spots in a kitchen, like small countertop appliances, or the rubber seal on the refrigerator, or beveled cabinet doors. This little terry cloth bag is great for people who make a lot of salads, or who cook with a lot of greens like kale or collards. After washing lettuce, greens or other vegetables that you might want to prep and store rather than using right away, put them in the Salad Sac and stash it in the fridge. The bag absorbs excess water so greens don’t go soggy, but retains enough moisture to keep the greens hydrated.